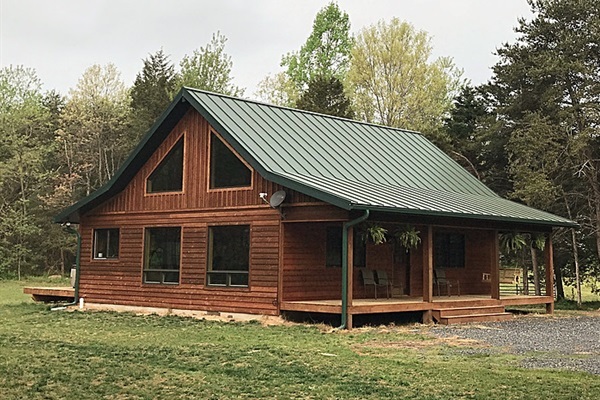 Turtle Rock Cabin was built in 2016, and located in the beautiful Shenandoah Valley, 15 minutes from the town of Luray and 30 minutes to many popular attractions such as Shenandoah National Park, the Shenandoah River, and Luray Caverns. This cozy, secluded cabin sleeps up to 4 guests ( up to two other guests may be allowed upon request) and is fully handicap equipped, and boasts two queen beds, while the third bedroom has a double bed. A lovely living room comes with an electric fireplace, Wi-Fi, and satellite television, while a dining area includes plenty of seating. The kitchen is fully-equipped offering all the comforts of home and there is a laundry closet for longer stays. *Please note, linens are NOT Included. We welcome you to bring your own sheets and towels or would be happy to provide linens for an extra fee. Air conditioning keeps things cool in the summer, and an electric fireplace in the main room is sure to promise cozy stays in cooler months. Outdoors, there are two large decks, a luxury hot tub and a BBQ grill. The cabin is Non-Smoking and Open Year Around ! *We may require a 3 night minimum and prices are subject to change on Weekends or Holidays. Please Inquire to get a quote. Page County is home to the world famous Luray Caverns and the Shenandoah National Park, the scenic Skyline Drive, the Shenandoah River, and Blue Ridge Mountains. Just a few miles in any direction there’s an abundance of natural resources and a range of activities including camping, canoeing, cycling, fishing, golf, hiking, horseback riding, photography or simply marveling at the scenery! Any season is a great time to visit; each is unique and beautiful.